The last thing you want to do once you get that permission is lose it. After all, building an email list is a net number. Beyond gross ads coming in, you don’t want to unnecessarily lose email subscribers. 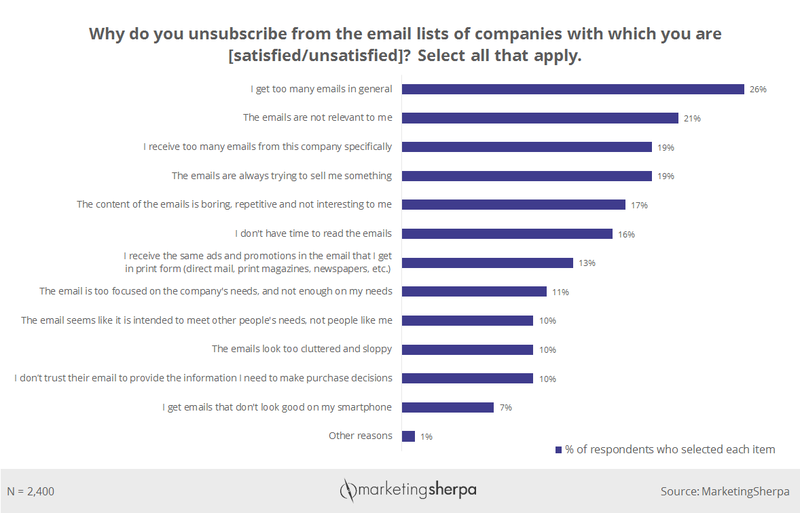 So, in this week’s MarketingSherpa Chart article, we explore the reasons consumers say they unsubscribe from brands’ email. As we were planning the content for MarketingSherpa Summit 2017 in Las Vegas, we conducted online research with 2,400 consumers, sampled to reflect a close match to the U.S. population's demographics, to better understand their preferences. We split them into two equal groups — we asked members of one group about a company they were satisfied with, and we asked the other group about a company they were unsatisfied with. Why do you unsubscribe from the email lists of companies with which you are [satisfied/unsatisfied]? Select all that apply. To see 35 more charts from the study, download the free reports. The top reason customers unsubscribe from your email, at least according to the customers themselves, is that they get too many emails in general (26%). Volume was a common theme — the third-most frequent response was “I receive too many emails from this company specifically” (19%). While these numbers give us the 10,000-foot view, let’s listen to the voice of the customer in their own words to really feel what they are experiencing. 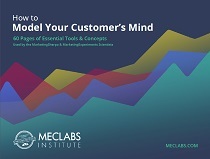 Let’s dive deeper into consumers’ qualitative responses to see what else we can learn. How frequent is too frequent? The above data can seem disheartening at first to the email marketer. However, from previous MarketingSherpa research we discovered that 86% would like to receive promo emails at least monthly, and 15% would like to receive promotional emails every day. And really, this question of frequency isn’t unique to email. It applies to everything in life. If I asked my elementary school-aged daughter if she would like vanilla ice cream with sprinkles on top for breakfast, lunch and dinner, she would likely be very happy. However, after experiencing this cadence for a few days, we would both soon realize that this is not the optimal frequency. So how much email is too much? As I mention from the previous data above, there isn’t one correct answer. Different groups of people on your list will want email at a different cadence, and you should either test to determine the optimal frequency for your list as a whole — or, if you can’t get that granular, test across your entire list and average it out. This means you will underserve some customers who want more email but also alienate less customers who do not want as many as the high water mark. One way to cut down on email overload is to send email more frequently when customers have taken an action to indicate they would like to hear from you. As one consumer advised, “Not sending emails to people that don't open them.” With a marketing automation platform, you can determine who is opening (and clicking through) your email. You can then send that group more email without overloading the rest of your list. As the above consumer suggests, give customers options for how often they receive email from you. You can do this by having multiple lists in a preference center, offer multiple frequency options, or instead of only offering consumers the option of unsubscribing, give them the choice to “opt down” to less frequent emails. According to previous MarketingSherpa research, half (49%) of consumers would like to subscribe to receive emails at a frequency they chose, versus a quarter of consumers (24%) who prefer to subscribe to receive emails at a frequency chosen by the brand. As much of a hot-button topic as email send frequency is, content also played a role in unsubscribes. One-fifth of American consumers (21%) unsubscribe because the emails are not relevant to them. This was the second-most frequent response. Aside from generally practicing customer-first marketing by understanding how you can help your customers (even when they don’t buy from you), lifecycle email marketing can play a role here as well. As one respondent remarked, “I may have purchased from them and no longer need them.” How can you keep a relationship with customers and keep sending relevant email to them throughout their lifecycle with your brand or product? This is especially important for less frequently purchased products. Right after the purchase, you could focus email messages on how to get started with the product. Then later, you could share ideas around little known features and how other customers are getting the best use of the product. Farther down the line, you can talk about warranty protections. And as it gets close to product replacement time, provide tips for researching products and special, owner’s-only discounts. “The emails are always trying to sell me something” was tied for the third-most frequent response, with 19% of consumers expressing this frustration. So, make sure you take a customer-first marketing approach to your email in general. Naturally an article with data about why consumers unsubscribe is going to skew to the negative. So, let’s find some sunshine. An element that many in the email marketing industry thought could be a major cause of unsubscribes — email that doesn’t look good on smartphones — was actually the reason least often cited by consumers for unsubscribing (7%). This may be because brands have gotten better at creating mobile-friendly email. Or, it could simply be that unsubscribing while conducting “email triage” on a smartphone while you’re on the go is just too much of a hassle. At the end of the day, this data is general and represents all American consumers. But unless you’re a behemoth, the audience for your marketing is not all American consumers — it is your unique niche that you provide value to in specific ways. So, use this data as inspiration for hypotheses that you then test with your audience to ultimately find what is most effective.